technocator: Are All Customers Happy with The New iPad? technocator: Are All Customers Happy with The New iPad? Are All Customers Happy with The New iPad? 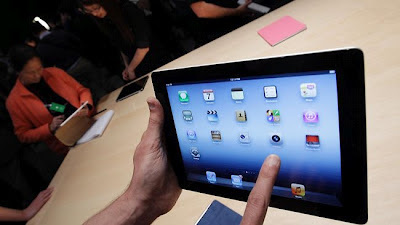 Apple has already sold three million copies of the new iPad, but not all customers are happy.The new iPad on the market in several countries around the world, but in some countries it can only be purchased on 23 March - and it appears that sales have surpassed all expectations. In the early days, Apple has sold three million copies of the new iPad. This figure does not include all pre-orders received up to launch. The new iPad has gotten good reviews, but there are also reports of problems with chipset. Many buyers have noticed that the iPad will be very hot. The phenomenon is also discussed in the official Apple support forum. An infrared image of the Dutch blog Tweakers.net confirms that the new iPad will be about five degrees warmer than its predecessor iPad second This may be because the new graphics chip, which sends the temperature up to 33 C during peak hours. Thus, the temperature is still within Apple's allowable limits between 0 and 35 C.
But it may mean that chipset quickly becomes overheated and must cool down when the weather gets warmer in the summer. The old iPad was soon too hot if it was located too long in direct sunlight on a hot day, and it is possible that the problem is even worse with the new model. It is arranged a heat-conductive plate which transfers the heat directly to the back panel. Another problem is that some of the so-called smart covers can not be used with the new IPAD. Photographer Mark Booth wrote in his blog that Apple has built a new sensor, which requires Smart Cover'ets magnet must have a specific polarization. Apple offers, however, to replace the Smart Chargers for free in its Apple Stores. A few users report a yellowish tint on the display. Apple has previously had problems with the color yellow and there may be a defect in the individual models. There were also reports of similar problems with the iPhone 4, which allegedly caused by glue was not dried correctly. So are you happy with your new iPad?